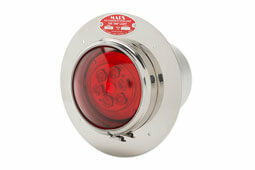 The Tri Lite Mars "888" Traffic Breaker is available in the flush mounted version shown here. This model provides a unique, clean-line profile with proven Mars "888" performance. Highly polished Stainless Steel Mounting Flange. 7" high, 10 3/4" diameter, 7 1/2" long.